We have observed a frameless design in a variety of keyboards and it is fair to say that the simple yet sleek aesthetic that reveals the rows of mechanical switches looks fantastic. Though once you have an appreciation for the ease of cleaning the design inherently provides, the aesthetics soon become a secondary consideration. Remember the days when hair, dandruff, dust, cigarette ash, and last years supper were all collected in the crevices of your keyboard, and the true extent of the nastiness was only ever revealed in that annual 'upside down bash'? This is still a reality for many people. 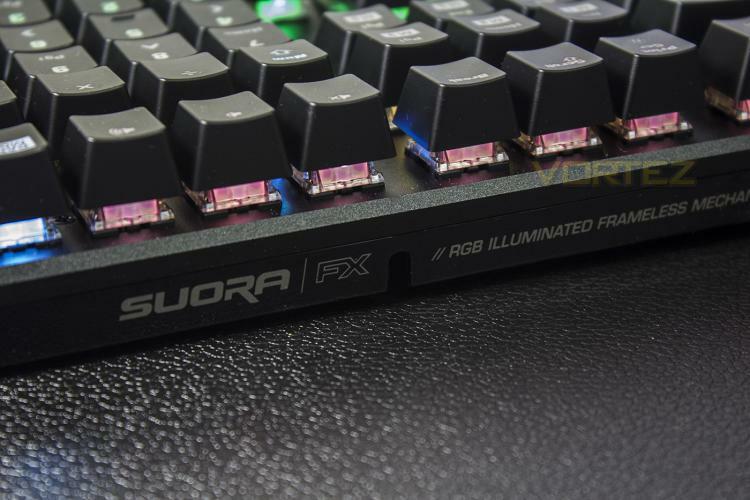 The SUORA is ROCCAT's compact and most raw gaming keyboard. It features robust TTC mechanical switches that are rated for 50 million clicks in the brown flavour (let's think chocolate here). These switches are then mounted directly into a blackened aluminium plate, and have been given all the performance gamers would expect including N-Key Rollover (anti-ghosting), and a 1ms refresh rate (1000Hz polling). Though designed as a driverless keyboard ready for plug and play action with a dedicated Game Mode button, though with the power of ROCCAT SWARM, you have access to key remapping, 6 dedicated macro keys, and per-key customisable illumination.